2nd Amendment Sleeveless Black Vest | BUDK.com - Knives & Swords At The Lowest Prices! 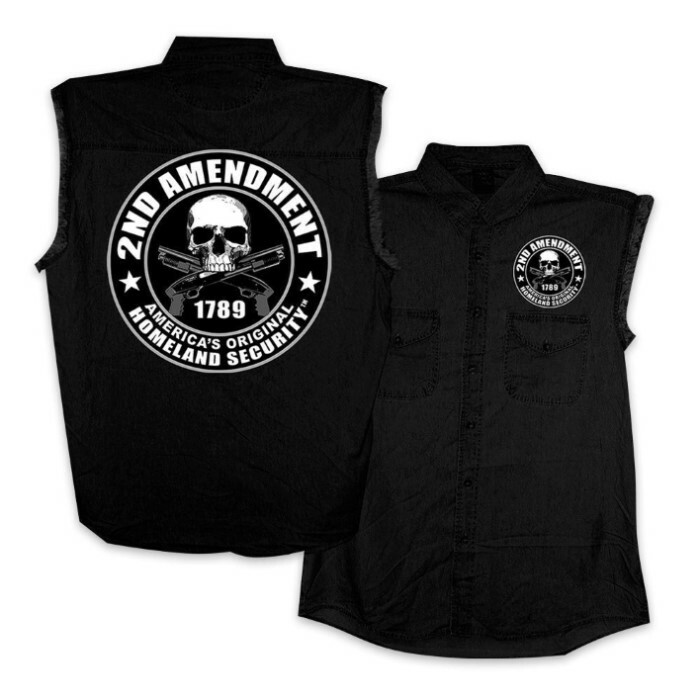 Display your beliefs proudly and boldly with this Second Amendment sleeveless vest. It features a skull and second amendment/homeland security slogan. This vest is really comfortable and looks great. There is no denim at all, on the site it says denim but on the tag its 100% cotton. I'm not disappointed in any type of way because the vest fits good and is very breathable. The fact the site says its denim and it isn't is the only reason no 5 stars. I saw this shirt, and had to wait until the 6th to order it, either that of order it, and wait for the back stock. So the 7th came, and I looked at the shirt again, and it was in stock, so I purchased it. I got it today, and was hoping it was cheap feeling, and that it fit correctly, I'm an XL. Well, it fit perfectly, feels great, and looks awesome! I was really impressed with the quality. My 1st apparel order from BUDK. And it won't be my last.